Three more HD OBVans in our catalogues, the Biathlon shooting event in UltraSloMo, the start of the Red Bull Crashed Ice tournament in St. Paul, a preview on Olympic track cycling in the London Velodrome, the lighting of the Latin Grammy Awards, new lighting consoles at ORF in Austria, Emmy for Panasonic's P2 and Oscar for Pictorvision's Eclipse, 3D live events by Sensio and SÉQUENCE, 3D Sports in Turkey and 4K 3D for cinemas from a single server. CBC Mobile Production has been providing top-quality mobile teleproduction services based on the highest quality engineering for over 40 years. It has been earned a long-standing reputation for delivering high-end audio and video production services for live events and for taping sports, arts & entertainment, news and special events programs throughout Canada and the US. The mobile fleet includes 3 state of the art HD OBVans. Innovative, dynamic and reliable, CBC Mobile Productions has earned a national reputation for excellence in its field, making it the largest mobile audio and video service provider in Canada. With first-rate facilities and engineering expertise, CBC is proud of its leading role in the mobile production industry, and poised to remain at the forefront of the ongoing High Definition revolution. The CP Mobile Productions HD-1 Mobile Unit is designed for those events that need a small, versatile, high quality mobile unit instead of flight pack build outs. Ideally suited for small regional productions like local college events, smaller corporate meetings or shows, side by side productions, and regional sports. With its 27-foot Dotcom Mobile production truck, CP Communications and Total RF are opening a new door for shows with the ambition but not the budget for a full-scale HD production. From college athletics to corporate shows, streaming content is exploding, which means that the Dotcom truck is getting plenty of interest, even if not every production is in high-definition. CP Communications also hopes to take advantage of some side-by-side business with this truck. Reckord Outside Broadcasting is a Czech company based in Chomutov. The company was founded in 1996. 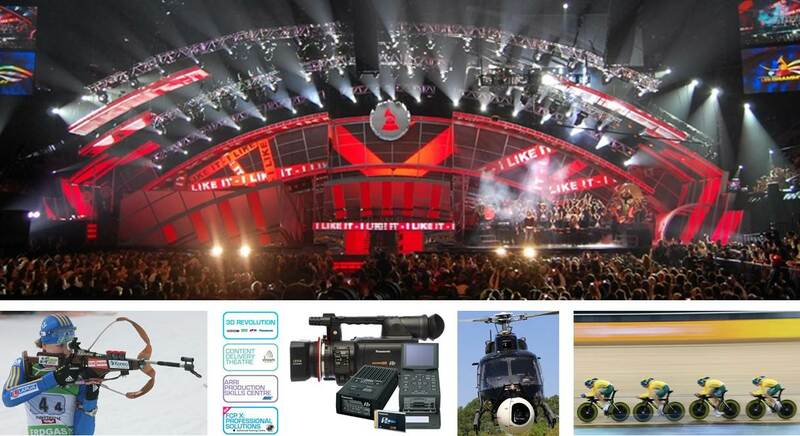 Reckord offers services in the area of live TV broadcasting and recordings, production of TV programs, shooting of advertising films and post-production. Reckord is able to ensure the full production (producer, cameraman, sound engineer etc.). Currently Reckord is operating two HD OBVans and one HD SuperSloMo Van, but is in the process to built two more HD trucks. Customers of Reckord include the Austrian Bundesliga, the UEFA Champions League, FIS winter sports events and the Czech championship in motocross Racing. Reckord now also has opened an office in Poland. Since 1983, CTV, headquartered in Via del Pellegrino in Vatican City, has broadcast the Pope's pastoral ministry and other activities of the Holy See. Each year, they cover about 200 events from inside the Vatican as well as during the Pope's travels in Italy and abroad. The network’s footage is picked up via satellite by broadcasters, news agencies and editing facilities around the world. CTV has no production studios, as a majority of the broadcaster’s work is ENG. The new OB van, which has full HD capability, has become the central hub for critical operations at the network. Its four operating areas include the audio room, equipment room, primary and secondary production control with VTR and camera control. The extensive communication capabilities offered by the four connected Eclipse-Median, six I-Series intercom panels, two Tempest BaseStations and four Tempest BeltStations assure that CTV broadcasts have fast access to reliable, high-quality communications. The London 2012 competition will take place in the new Velodrome, built especially for London 2012 in the Olympic Park. The track in the Velodrome has been laid with 5-metre lengths of Siberian pine, and is banked to an angle of 42 degrees at its steepest point. Organisers want the world’s fastest track and so have tailored the track’s geometry and modified internal conditions (keeping the temperature high and air still) to optimize the chances of records being broken. Riders are expected to reach speeds in excess of 75mph. The 2012 Games will not include the madison or individual pursuit as they were both dropped by the UCI in an attempt to increase greater parity between men and women. The Velodrome will host 10 medal events. GT is a race where pilots of Super-Cars (Ferrari, Lamborgini, Aston Martin, etc.) compete. Providing services both to the GT3 and GT4, with two races by stage, wTVision is giving a great contribute to this sport television coverage’s evolution. The synergy between wTVision and GT has provided a visible increase in this race’s broadcast quality among several TV channels. Through the creativity employed in the graphic templates and the official timer’s integration, the company reveals its solution and graphic platforms’ versatility, both in constant change. Since 2010, wTVision is present in several motorsports competitions in South America, especially in the Brazil. Acquiring 3 competitions, in 2010, and adding 8, in 2011, wTVision is reaching a notorious status in that region. GT is one of its success cases. Kyle Croxall had a flawless run in the finals of the 2012 Red Bull Crashed Ice season opener on Saturday down the 406-meter long ice track filled with jumps, bumps and mind-boggling twists and turns, rallying from just behind the Finn to end Pihlainen’s three-race winning streak. Pihlainen lost his balance on a jump near the bottom for a split second and crashed hard into the boards. He fell to third place before recovering to win a photo finish for second ahead of Scott Croxall. Despite pre-race snowfall and temperatures that fell far below freezing, a frenzied crowd cheered the 64 finalists from 24 nations as they raced down the most challenging track in Red Bull Crashed Ice history as it weaved its way from Cathedral of Saint Paul downhill towards the banks of the frozen Mississippi River. There were a number of monumental crashes on the high-speed track as racers hit speeds of up to 40 mph and the level of competition took a leap forward from 2011. Five of the 19 Americans made it to the round of 32 but were ousted by the more experienced Europeans. This season´s opening production took place at the Biathlon WC in Hochfilzen, Austria. Host broadcaster ORF chose the Antelope MkIIs system for various reasons. One main reason was a requested frame rate of more than 2.500 frames/second without any interpolation or image processing in native HD. The Antelope records up to 5.350 frames per second in native HD. The wide format chip which is based on the Phantom V641 technology does not require to perform any interpolation or image processing even when frame rates go up as much as 5.350 frames/second. The use of specially designed controllers for both engineering and replay operations made it easy to supply stunning replays for both the world feed and the ORF national feed which have never been seen before on television. "While soccer and other slower sports use other ultra-slow-motion systems which record 300-600 frames/second, it makes a huge difference to have replays with 2.000 or 4.000 frames/second specially when shooting fast sports like alpine skiing, biathlon or ski-jumping" says Nikolai Bonstedt, R&D Engineer and operator on site. Vinten Supports New Season of “Are We There Yet?" Engineer and Project Manager for the upgrade Manfred Wagner explains why the grandMA2 was chosen, “We had plenty of good experiences with the grandMA ‘series 1’, so for this reason the grandMA2 was a pretty logical choice. The grandMA2 is not only extremely reliable but also offers powerful backup solutions and is a perfect option for TV projects, because we can’t afford failures! Additionally, the consoles and MA NPU give the performance we need for the sophisticated studio lighting set up as well as the flexibility to control a variety of lightsources - conventionals, moving lights, LEDs and video”. Engineer Karl Nöbauer is the studio’s chief operating officer for productions and Engineer Reinhard Traxler is head of lighting production. The MA equipment was delivered by Lightpower GmbH and the installation undertaken by Gelantec, Gesellschaft für Elektronik und Anlagentechnik mbH. It’s the first such end-to-end digital news production system from Grass Valley installed by a local Japanese broadcaster and clearly illustrates how Grass Valley’s vision for highly affordable, IT-centric local news production technology can make a huge difference in staff productivity. The new equipment, which includes Grass Valley EDIUS® editing systems and K2 Summit™ media servers configured as a storage area network (SAN) environment, will help the station’s news staff collaborate and create more news content, faster and more efficiently. It is scheduled to be fully operational and on-air by June 2012. ABA is now implementing a next-generation news production solution based on the Grass Valley K2 SAN and a Grass Valley STRATUS™ software architecture framework for the ingest, organisation, and archiving of daily content with proxy data. Attached to this network will be a series of Grass Valley HDWS 3G Elite, HDWS 3G, and REXCEED 750V turnkey nonlinear editing (NLE) systems that feature the latest 64-bit Windows 7 OS, and Grass Valley’s award-winning EDIUS 6.3 Broadcast software to support ABA’s shared storage HD editing workflow processes. The BVE 2012 free seminar programme is the largest of its kind in the UK, with 11 theatres presenting over 250 seminars across the three day event at Earls Court, London, 14-16 February 2012. From big picture issues such as the next steps for 3D and new developments in the areas of religious broadcasting, cloud computing and brands becoming broadcasters, to practical hands-on workshops, BVE provides unparalleled access to the leading thinkers and major players in the international broadcast and production community. There will also be some fascinating one-day sessions dedicated to exploring various aspects of a specific topic. Religious Broadcasting is discussed on Tuesday 14 February, followed by Demystifying the Cloud on Wednesday 15 February and Brands Becoming Broadcasters on Thursday 16 February. Added to these are practical sessions offered by Avid and ARRI, Adobe and FCP X sessions run by Soho Editors. Plus of course there are over 50 seminars running in The Production Show (TPS), offering great practical information and advice to content producers, with topics covering the many facets of production. The P2 recording media and accompanying hardware were introduced in 2003 and provided a substantial improvement in workflow by being file-based with computer editing; a significant reduction in maintenance and operating costs by eliminating mechanical transports from cameras and recorders; and an overall higher reliability. Subsequently, Panasonic has driven the proliferation of solid-state video acquisition with worldwide sales of P2-based products surpassing 220,000 units. With the industry’s first solid-state, no-moving-parts design, P2 products have dramatically reduced the downtime associated with mechanical issues. P2 products are better able to perform in extreme environments and are resistant to temperature extremes, shock and vibration, unlike mechanical tape, hard disk, and optical disc systems. Reducing the ongoing cost of acquisition, P2 cards can be used reliably again and again, without deterioration in quality. The Academy notes, “The Pictorvision Eclipse system allows cinematographers to capture aerial footage at faster flying speeds with aggressive platform maneuvering.” Designed by the same team who pioneered aerial stabilization for cameras 35 years ago, the Eclipse represents a revolutionary milestone in the advancement of aerial camera platforms. It incorporates proprietary patented XR Motion Management technology that enables the most advanced steering, stability and pointing and tracking capabilities. Eclipse’s advanced control system, open architecture and ability to handle long and cumbersome lenses allow top aerial cinematographers to capture creative shots never before attainable. The system was used on five of the 2011’s top 10 highest grossing live action films; “Twilight: Breaking Dawn Pt. 1”, “Fast Five”, “The Hangover Part II”, “Rise of the Planet of the Apes” and “Thor”. "SENSIO is delighted to be working with SÉQUENCE SDP, a company that has gained the trust of the most talented and successful artists on the planet by bringing together all the conditions to meet their requirements in terms of sound and image quality, one of their main concerns. In this privileged context, they can give unforgettable performances to their fans," said Richard LaBerge, Executive Vice-President and Chief Marketing Officer. "With this alliance, SENSIO is delivering on its promise to develop cultural live 3D events for the Live 3D market. This announcement signals the first big step in our implementation of this strategy." SENSIO® Hi-Fi 3D technology has been trusted by the biggest names in event creation and promotion since it powered the very first live 3D event in 2009 (the BCS Bowl). Since then, the company has continued pioneering with the creation of a business model for live 3D in cinemas and the SENSIO® 3D Live Network — a solution for the worldwide cinema distribution of high-profile live 3D events. SterGen’s innovative technology enables real-time conversion of camera feeds and footage into true stereoscopic 3D. Its real-time 3D image processing gives producers a high quality, yet cost-effective alternative to expensive and logistically complex native 3D productions. SterGen's software will be used for both live sports events as well as to add 3D visualization to previously recorded sports programming. “Stereo 3DTV greatly enhances the viewing experience, especially for live sports telecasts. For this reason, we’re extremely pleased to be able to leverage SterGen’s powerful technology to provide high-profile 3DTV sports to broadcasters and other carriers in Turkey,” said Selim Usta, Saran Media’s Head of Sports. “We’re thrilled to partner with SterGen and bring this pioneering technology to our country in a way that will dramatically enhance our sports programming.” SterGen’s real-time stereo 3D technology platform will also enable Saran Media to produce stereo 3D content with a dedicated 3D depth effect for optimized display on glasses-free 3D mobile phones and tablets—a rapidly expanding new market segment. In response to rapidly growing demand from the 3D production community, Sony proudly introduces the new PMW-TD300 – a professional 3D shoulder camcorder. With its shoulder-mount design, this camcorder has a highly compact body, and provides a stable shooting style that is crucial to creating good 3D images. Affordable and fully integrated, this 3D camcorder reduces the burden of complicated user adjustments before shooting, such as left- and right-lens alignment. This is a powerful tool to support the rapidly expanding 3D video production industry with an ideal combination of mobility, stability, and affordability. With the PMW-TD300, both 3D and 2D shooting are supported. With a single SxS card, the camcorder is able to shoot images only through the left lens. In addition, when recording in 2D operation, it’s useful to be able to parallel record onto L/R cards.